In this interview Janet tells Dorothy about making a ‘Friendship Star’ quilt after the death of her 15 year old daughter, Rebecca. The quilt was constructed from ‘significant’ fabric relevant to Rebecca’s interests, family and friends and took six years. Janet talks about the pain of losing a child and how quilting and the support and friendship of a quilt group helped save her sanity. They move on to discuss Janet’s love of Baltimore appliqué and redwork and her involvement in the formation of what ultimately became Heirloom Quilters. 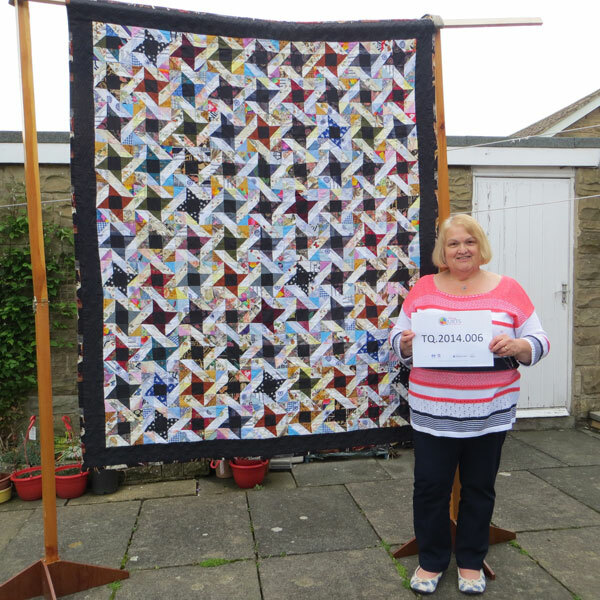 Janet modestly discusses her pleasure derived from teaching, making and sharing quilts with others including children and her charity/fundraising efforts. She also describes her enjoyment of attending the British Quilt Study Group and documenting the quilt collections of two local museums. DB: You’ve got a very, very special quilt with you. Why did you choose this particular quilt to talk about? JC: Because I made this quilt after my daughter died. I made it using her clothes and clothes from her friends, her close friends and family and it was suggested to me by Carole Kirby who at the time taught me patchwork. 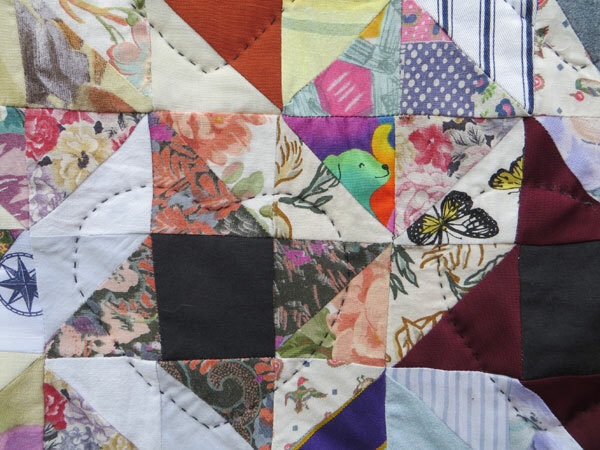 I started the patchwork classes about a year after Rebecca died and it was something I’d always wanted to do and she said ‘why didn’t I make a quilt?’ and I said ‘I couldn’t possibly do it’ and she said ‘well, there’s no rush’, and put them in a suitcase and do it sometime. And I gave it some thought and I gave it some more thought and the following year she went to a quilt show and she brought me back a journal and said I had to record my thoughts and my feelings whenever I started this quilt so I thought it’s about time I started it so I wrote to Rebecca’s friends, her close friends, she had three close school friends and asked them for an item of clothing. I had the shirt my husband got married in, an pair of awful navy blue and flowery trousers which were mine and an apron of my mum’s ‘cos that’s all I’d got, my mum had died in when Rebecca was only six, so mum would’ve been dead twelve years so we’d nothing else other than an apron. I chose ‘friendship star’ and like most fifteen year olds she wore a lot of black so I decided at the centre of the square would be black and I would obviously shade the lights and the mediums so it would give it a bit of a 3-D effect and away I went. The only fabric I bought was fabric that meant something. I bought bees and butterflies because she loved living in the countryside, I bought hens ‘cos we kept hens at the time. I bought musical instruments because she played the violin and I bought horses because she rode horses. I used her school skirt, it’s got no points, her school tie, her pony club tie, a brownie dress which I’d kept from when she was six, seven, and her brother was in the army cadets, his first pair of decent army cadet trousers which weren’t combat and, ah, away I went. But it took about six years really because there were some times when I could work on it and there were some times when I couldn’t. I just, the thought of even feeling the fabric made me feel sick. And I would, in this little journal which Carole bought me I talked to the journal and I said, I remember writing, you know, Adam was growing up and you’d be very proud of your brother and things like that and um writing it’s been twelve months since I’ve touched this, we need to get on. It took me, I started it in 1991 and it was finished, quilted, bound in 1998 which is a terrible long time to make a quilt. DB: Do you look at the quilt from time to time or…? DB: Yeah. 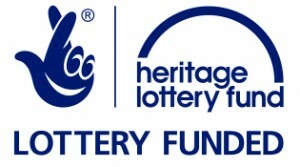 Have you come across other people, met other people who’ve been through very difficult situations and used this? DB: How long was it before you showed this to anybody? JC: I show it to anybody that’d look at it [laughing] ‘Do you want to see my quilt?’ Yeah I did, I mean I did belong to Heirloom Quilters then, we, because the classes I started with Carole, we carried on when we’d done our twelve weeks, it was nearly a year we did, we wanted to carry on and meet together and Carole was very, very nice. And we started to meet in each other’s houses just about eight of us. More often than not there were only five or six but I think there were about eight initially and then Penny suggested we should form a group. Penny sent all this, sent us all a letter, Penny was one of the original class members, she said ‘we will call this group Heirloom Quilters and we started off with about ten of us and we, I can’t remember how we advertised or whether it was just word of mouth and we met at the Friends’ Meeting House and we were very inclusive. Anybody could come because that’s what it’s about isn’t it? Sharing and, ah I can’t even remember what we used to do at the beginning whether we just we used to. We had a funny treasurer who, we never had any money because [laughing] oh well, it was funny but she never did any sewing either [both laughing]. DB: Just liked being in a group? JC: She liked being in a group, yeah but, she didn’t steal the money, I’m not saying she stole the money or anything like that, it was the fact that she used to stand up and say ‘yes, we have some money’ and then sit down again [both laughing] I’m not, she had a business, she was honest, it was just funny you know, when you look back to where we are now with a constitution and a committee. DB: So do you think the kind of nature and character of quilt groups has changed down the years? JC: I’d like to think we’ve all got better and I like to think that we do more for the community than we used to do, you know everybody used to bring their own sewing and now you know we haven’t done it for the last couple of years but many years ago when we first started to have a quilt show, before we had a quilt show, we’d often do a quilt for the year we didn’t have a quilt show for charity. I remember we did one for the ladies’ Saturday Friends, or Monday Friends or Tue, I can’t remember what, a group of ladies who were recovering from Breast Cancer who used to have a big fashion show in Scarborough and we gave them, we made them a quilt, I think we did ‘Pieceful Hours’ which was a rather nice peaceful title for somebody who’s recovering from cancer, it was a beautiful block, really nice block. DB: You’ve been very active, very proactive really in terms of local quilt group and other organisations, the guild and so in organisational terms you’ve been very active. JC: Yeah, I think, if I’m honest, my doctor used to say to me, are you still running away? And I am. I know I still am and I’m getting too old to keep running! [laughs] But you handle things how you handle things and I find it’s easier to be busy. [DB yeah] It’s easier for my peace of mind to be busy. And I like being busy. I like being part of the community. I’m involved with the Church, I used to, when we first moved to Scarborough when the children were six and five I did Riding for the Disabled within a year. I’d never done that but I’d kept horses and Rebecca rode and then we bought her a pony and I did Riding for the Disabled for thirty years, got a twenty-five year certificate from Princess Anne, I got it when I’d done thirty-one years but [laughing] who was counting, a bit late by twenty-five years, but she was in the area so she presented me with my long-term badge and certificate which is now in the loo! [both laugh] [DB Like an Oscar, isn’t it!] [both laugh] yeah, in the downstairs loo! DB: You’ve done, I know, from my experience, you’ve done a lot of work on the teaching side as well. You’ve moved from being a quilter, which you still are, but into the teaching side. JC: I’m not very good at it though. I don’t think I’m very good at it. DB: Well, having been on the other end of it [both laughing] I assure you, you are! But you run sessions once a month, don’t you, [JC I do] locally. JC: But I usually bring a tutor in. I do usually teach one a year and Anne teaches one a year but I’d rather see someone else do it. I find it’s all the preparation and what seems easy to you doesn’t always seem it, and I find the biggest drawback I have is being left-handed [DB ah] and I find I’m so left-handed that I find it really hard and I, like Beryl who comes to teach, she can quickly adapt left-handed to right-handed. I struggle. If I’m doing 60° angles for instance, even if I’m doing them myself it takes me five minutes to get my head into. Once I’ve got my head round it, I’m fine, but it does take me time and I think that’s not very good for a teacher. DB: Maybe there’s a whole market for left-handed quilters [both laugh] The Beryl you mention, is Beryl Frank? DB: Yes, she has a studio. DB: It’s an out-joke now! [both laugh] I know you’ve quilted, I know you’ve done patchwork, but is there any other technique that you’ve really, truly enjoyed in terms of sewing? 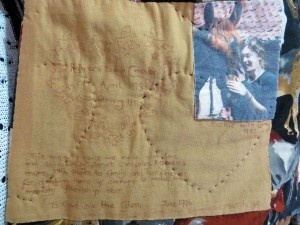 JC: I don’t do a lot of piecing now, I love appliqué, I love Baltimore appliqué. That’s my love. DB: Where did you come across that? JC: I went to, a friend of mine went to a residential course at Alston Hall in Preston every year and I heard about it after the second year she’d gone and said I would love to go so she gave me all the details and I managed to get in and I went for five years ‘til it finished really. She was an extremely good teacher we had, that was Patricia Cox and we had an English teacher Betty Mansfield who was technically an embroiderer, she’d made quilts for Westminster Abbey, alter frontals at Westminster Abbey, she was an extremely good embroiderer. So she taught us the finer bits, the embellishing and folded and 3D type of flowers and Pat taught us. The first thing we had to do was appliqué a leaf and an oct, it wasn’t an octagon. A five-sided piece, five and we had to appliqué a piece of white fabric onto, I think it was equally, I think it was still a light fabric but we had to appliqué the white with black thread. And until we could, we had to make sure you that you couldn’t see the stitches and once she was happy she couldn’t see the black stitches on the white bit of appliqué we were allowed to sew a leaf! [laughs] It took two days till we chose our first block and then we did, all did the Alston Hall basket which Pat had designed and I think I went home with part of the basket and about four leaves on after a week’s work but was hooked, absolutely hooked. She used to give lectures in the evenings and talks on her quilts and very, very knowledgeable on all Baltimore quilts. DB: Cos she was from America? JC: Yeah, yeah, a very well established teacher in America, so, but I love Baltimore, I love it. DB: Have you travelled yourself for quilting? JC: Yeah! I’ve been to America a lot of times to the quilt show in Lancaster County. I have a friend who lives in Pennsylvania, she is American. We started off writing to each other in the 80s and now we email. In fact she emails every day. I speak to her more than I speak to my sister! [laughs] but she’s, she’s very nice is Linda. She comes over here now every year so, because her son married an English girl, and they live in Worcester, so she’s two grandchildren in England. But every year when I went, I went to the Pennsylvanian Quilt Extravaganza, I used to go twice a year sometimes to Pennsylvania Quilt Extravaganza in September and go to Lancaster in the Spring, in April. And one year I went with another one of our quilt group members, 1999 we went to Houston which was the biggest quilt show I’ve ever been to and the only time I’ve ever thought ‘you know what, I’ve had enough!’ [both laugh] The fourth day, I really did not want to go back so ah, but it was just because it was so much, and so many people and so many stalls, it was amazing! But they’re very, very good at what they do, you know there’s some fabulous, fabulous quilters. A lot of them fabulous men quilters out there. DB: How are you as a shopper? For quilts [JC laughs] and notions? JC: I don’t do gimmicks very much. I used to do like we all did, bought all the gimmicks, and I don’t buy rulers. I just have a long ruler and a short ruler! [both laugh] but, um because you can cut anything else you need with them. I like to buy fabric, but we all like to buy fabric. When I first used to go to America I used to come back with suitcases loaded with fabric but no plans. So after about three years I thought ‘you know what, I’ll go with a pattern or buy a pattern, buy the fabric for that’ and I have a box at home with the fabric and the patterns for about four quilts and still I keep buying more! [both laugh] I really should stop and I did decide that this year was the year of finishing off and it’s got to June and I think I’ve finished two things off which is, but started loads of others which is really wrong, I really should be finishing what I’d started, and I will do. DB: Tell me about your stash. JC: Ahh! I have a wardrobe [both laugh] a double wardrobe which I bought from the Pine shop and asked if they would put drawer, shelves in, and he said yes he would and he kept looking at me quite strange, why I would want shelves in a wardrobe. And he said ‘when I come to your house will there be someone to help me up the stairs with this?’ and I said ‘oh, it’s not going upstairs!’ [laughs] ‘it’s going in my dining room’ and he says ‘OK then, what are you doing with this?’ I says ‘it’s for my fabric’ and it is bursting at the seams really. I did try and use some up, I decided I wasn’t buying any more but you’ve never got what you need, have you? I’m using, I have used a bit up this year. I’ve used background fabrics which I’ve had some fabric since Bar Street shop shut in about 2001 [both laughing]. So I’m trying to get through it ‘cos I won’t live long enough to do everything I want to do [both laugh] that’s what frightens me, what will he do with my fabric? My American friend says that when she dies I’ve got to get on a plane quick because Larry’ll have it all in the trash! [both laughing]. DB: So what do you think you’ll do with yours? JC: I’d like to think, I did say to David, funny enough we talked about this the other day, what do you do with all this fabric and I said if anything happens to me you give it to the quilt group. As long as they make something for charity out of it, they can have it, I don’t care, they can have it. Anyone can have it as long as it does somebody some good. But I’d like to think out of, cos there is a lot, they would make something for charity. That would be nice. DB: There seems to be a sense of friendship and sharing, either sharing your fabric or passing it on for charity, or we talked about your friend in America, how close you are. 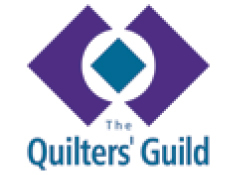 Would you say that the quilting community encourages, fosters that, or is it just [JC Yes. I do.] how individuals are? JC: For the quilt show next year, for the bargain, bargain cushion tombola. Some people find it easy, not everybody has got the time, or can afford to make a dozen cushions, because it’s a pound for the, sometimes I just think it would be far easier if you just give people some money! [both laughing] I just think, oh, don’t ask me for anything else! I’ll just give you some money but I do think it’s nice to do things and it’s nice to be involved. I quite like the friendship of being in a group. I would miss it if I didn’t go. [DB Yeah] I think I’ve made a lot of very, very nice good friends through quilting. People who’ve made a big impact in my life. And I think that’s worth everything then, isn’t it, if you make good friends. DB: Yeah. You enjoy redwork. JC: Oh, I do, yes, I forgot about that! DB: Tell me about your redwork. DB: What is it, as well? DB: How do you do it? Get a piece of fabric, what would you do with it? JC: I would, um, I’ve got to say that I personally would put some backing on the fabric, either some vilene but there’s some pellon which I bought from, I tried when I was in America and it’s I’ve got, I have bought it here, which you iron on the back and it gives it some body so when you stitch the stitches stay even and flat and it’s just a small backstitch. Two strands of embroidery thread and a small even backstitch. I’ve made Christmas, it’s ah, Christmassy, quite sort of Christmassy things. DB: So is it embroidery then or quilting? JC: I think it’s all married, isn’t it? It’s just a back stitch, so I suppose it’s an embroidery technique really. [pause] Ah, and I quite like the, what’s her name, the Australian woman, I like her type of quilts. JC: Lynette Anderson, I love hers which have got pretty embroidery, I’m not that good at embroidery but hers tends to be backstitch and I can do things like that, backstitch and knots but, and a passable stem stitch [laughing]. DB: Do you think there’s more of a combination of embroidery and patchwork and quilting these days? JC: I think so and there’s a lot of people are very good at it and there’s a lot of nice patterns out there and I think I’ve made that many quilts that you get to a point where there’s no room on the top of the wardrobe, there’s no room in the wardrobe and there’s no room on the pile at the side of the bed, ‘cos no-one wants them but I, people say to me ‘why do you make them?’ and I make them because it gives me pleasure. So I don’t smoke, I don’t drink so, it gives me pleasure. DB: Do you ever sell them? JC: No, I’d rather give them away. I’m happy to give them away. I like making, at the moment I’m on about twelve baby quilts for the special care baby unit. I should be making things for the quilt show next year and all I’m doing is oh, I’ll just make a quilt for the special care! Because they’re only twenty inches square and you can do them in an hour, an hour and a bit and I think well, if I don’t do anything else I’ve made something. I gave her six last time I saw her and gave her six the time before and I’m teach, not teaching, I’m helping a young girl with learning difficulties in Scarborough who wants to quilt and the college she’s at rang me and asked if I would help her so I took one of these baby quilts for her to sew. So she’s sewed it up last time I was there two weeks ago, she was so proud, she was thrilled to bits so when I go next Tuesday I’ll take the wadding and the backing and I’ll take my sewing machine which has an embroidery stitch so she can, I’ll draw a line down the middle and she can hopefully follow the line and so it will be quilted and sew the binding on then I can leave that with her to take to the hospital ‘cos Julie who is one of the special care nurses has said that she could take it up. She can’t see the babies but she can at least see where it’s going so I’m really, really pleased. I haven’t told her yet, I’ll tell her that on Tuesday. DB: Do you think that you’ve had an effect on other people through what you’ve done, thinking back? JC: It would be nice if I had, but I don’t think so, I’m just one of many [DB laughs] I went to do some quilting with the Mormon Church. I did some quilting with them, they wanted to learn to quilt so I took some, drew them an easy, I don’t know if it was a circle or a heart quilting pattern and got them all sewing. I never heard any more from them [laughing] maybe they didn’t like it! DB: Have you ever worked with children at all? JC: Oh yes, we, I quilted at school. First we quilted then we learned to knit. The knitting was horrendous but the children. First of all I did the, we did a quilting bee and it was quite fun actually. We learned whose daddy’s dyed their hair when mummy had finished with the hair dye [both laughing] which I found really funny! But they quite enjoyed it actually. And then we did an after school sewing class with them but I think with one of two of them it was just a bit of, don’t pick them up till four o’clock childcare but one of two of them were really interested. But the knitting was an absolute nightmare ‘cos after two rows they’d it didn’t grow fast enough. Knitting doesn’t suit children they need to see something grow. But we did do a wall hanging of balloons and we painted the fabric which was really good. We got some fabric paints and had a real go with these, it was quite enjoyable. And they all made themselves a cushion, so, they were a good group that year. I don’t do it at all now, I don’t think they have time for after school sewing clubs. DB: Do you think children miss out now on some of these crafting skills that maybe we did? JC: I think so really. They haven’t got time. They haven’t got time in school because of the pressures of the national curriculum and I think at home they’re too busy with iPads, iPods, computers, games. They just seem, I think life for children these days is very fast and it’s a shame because they miss out on. I mean I learned to knit with my auntie ‘cos no-one else could teach me to knit with being left-handed. She eventually stood behind me for a while, then sat opposite which was so simple. I just mirror imaged and it was fine but I liked knitting and she taught me how to knit and it was quite good with the children but only one little girl absolutely loved it and she got, she was the one who wasn’t very good at anything else so it was fabulous to see her shine. Even if it was only knitting it doesn’t matter. She was better than anybody else at knitting and that’s really good for your morale, isn’t it, to be good at something when you’re not usually. DB: Yeah, it’s said that quilting amongst other things is good for your wellbeing. Would you agree with that? JC: Yeah. I can’t sit in an evening without something in my hand. If I haven’t got, at the moment I’m finishing off an appliqué quilt, a red and green quilt that I started it four years ago at the last Alston Hall and I’ve been trying alternating that block with another one I’m doing and I thought ‘no, finish this off’ but, there’s always a but with me [both laugh] I haven’t got enough fabric but I bought it four years ago so there’s not a lot I can do. I’ve got enough to do the set-in triangles so that’s my, when I get a next full day to myself I’m going to trim the blocks down and finish the top. I think, I know it’s moda number ninety-seven, it’s called bleached white and obviously it’s not going to be the same dye lot but it must surely be the same shade [DB laughs]. So I did order some from the internet and they took my money and then told me that they hadn’t got it! [laughs] So it’s either on a ship coming from America, it’s either still in America, they’re going to ring me in three weeks and I need, I said to her I’ve only got, I can only give you a month because I want to be able to draw the borders to take to Parceval Hall to our, ‘cos I’ve, the borders have got more work in than the blocks. So the blocks will take me another year at least the borders will take me at least a year. But they’re really full these blocks I want to do the border wider, ‘cos I’ve, on the picture of the pattern which came from Pat, it seems quite crushed up to me so I think I’d like a little bit more room either end so I’ve ordered four metres of fabric, hopefully. What I thought I would do, ‘cos it’s all red and green, tiny bit of gold in, I thought if I put a red, a fine red band, border, maybe only an inch now, cut it at two so it’s only an inch and a half it will separate the two creams so hopefully it will take your eye away from, I thought if they were together you might, you will see the difference, bound to be a difference in the dye lot, but. Pat had done a green border and I was going to do a green border but I bought some green fabric I didn’t like [both laughing] so the border fabric’s costing me about seventy pounds, I’ve wasted thirty four pounds on four metres of green moda, but never mind. It’s a learning curve. I’m sure it will be used, it won’t be wasted [both laugh]. JC: Yeah, in the stash! It’s in the wardrobe, waiting [laughs] door pushed shut. DB: Now you’ve talked about using the internet, ordering fabric through, online. Do you use the internet for information, quilting patterns? Do you use YouTube, anything like that? JC: I’ve only used YouTube once and that was to watch the Jellyroll Race which I then organised one for our quilt group which was great fun. I occasion, I don’t use it that much for patterns. I did do, but I know what I like and I like what I like so I tend to not, but I get a weekly email from All People Quilt, I used to buy the magazine and occasionally they have really nice things on there and I’ll click on it and then one link leads to another link and leads to something else but I don’t usually, I don’t usually buy fabric online, never normally. But I think it’s because of trying to find this moda 97! Which Beryl knew exactly which fabric it was. I bought it from when she had a shop so I just hope its boat has docked! [both laugh] It will wend its way soon [laughs]. DB: If you could wave a magic wand, what would you chose to do if you could do anything in the patchwork and quilting world, what would you love to do or to achieve? JC: Mmm. I’d quite like to make a wholecloth quilt [both laugh] I’d quite like to do that. I’m trying to, I’m quilting a wholecloth cot quilt at the moment for my grandson, for Oliver. And while I’m doing it, I love it but then it gets put down at, because I find that if I’ve got too many things on the go I don’t do any because I can’t decide which I want to do, so I’m far better. At the moment I can’t appliqué, well I can I’ve got another one to do but I’m not that interested in it because I want to finish the other and I’ve got some redwork on the go because we’re, when we go to Parceval Hall we’re doing a Christmas, it’s fabulous, it’s so pretty, it’s a little robin and Beryl gave me the pattern, insider information [both laugh] because I’m quite sure that May Lodge will have an Autumn fair, so I thought they were easy to make, you can do one in an hour but the robin is really pretty. There’s an angel as well and I love angels but I like the robin better so I thought if I could make some, if it’s only a dozen, and I think I’ve done about five so I’ve been doing some redwork but then I want to quilt so I really should either pick the quilt up while I’ve got the chance and finish the wholecloth. That would be a good idea. I’ll get that out. JC: That’s my ‘to do’ list. DB: That’s it, yeah. You’ve talked a lot about sharing information and passing things on. If you could leave a legacy, other than your stash, if you could leave behind something, what would you love people to think? JC: I’d like people who’ve never quilted to quilt, to have a go at patchwork because of the friendship and the camaraderie that’s the right word. I think it saved my sanity and I’d like to think it helped other people. I’ve nothing else, so. I’ve nothing worthy yet, to leave to the quilt museum or anything. I, and I am not perfect, I know I make mistakes but I think as long as it gives me pleasure and it does give me pleasure, and I think I don’t want to win prizes, I’ve won Visitors’ Choice but that’s about it. I’ve won that twice but I just think the friendships and are really very, very important. DB: You’ve done quite a bit of work with museum quilts, quilts in a local folk museum [JC ooh, yes] alongside a colleague from the Quilters’ Guild. You’ve dated them, you’ve catalogued them and so on. How do you feel about, some of those quilts are very old, very utilitarian, how do you feel about them? JC: They can all tell a story and it’s a shame that they don’t. So many, I’ve really, really enjoyed that. 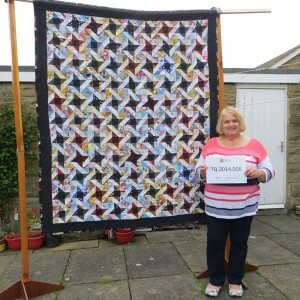 That was done through the Quilters’ Guild, through the British Quilt Study Group who asked Brigid Ockelton to help document the quilts at Ryedale Folk Museum and she said she’d only do it if I could help her. So that was fine, so once a month for nearly two years, apart from the odd month off we went to Ryedale and we re-catalogued the whole of their, using the Quilters’ Guild forms we re-numbered them, we photographed them, and dimensions, and we, we looked at fabrics, old fabrics. Brigid is very, very knowledgeable about old fabrics but it’s surprising what you learn. And, you know I think it’s good to do anything in, as a pair because one sees what someone else doesn’t see. We, I remember one day finding a quilt which was using pillar fabric, it was like tall pillars with a basket of flowers on the top and me saying to Brigid, ‘what a shame that one of these is upside down’ and she kept saying ‘no its not’ and it was but she hadn’t seen it, that she’d put one of the side panels on. It wasn’t glaringly obvious but one of them was upside down and I thought ‘what a shame’ I think I would have undone it but who, she might have had a reason for it. Maybe she wanted it so it didn’t matter which way up she put it on the bed, one of them were always right wasn’t it [laughing] I don’t know! But there were some really, really good quilts. They’d both got really good quilts and I’d really, really enjoyed it. [DB mm] I really did. DB: Would you say some of the very ordinary quilts are now quite precious? JC: Oh, I’m sure. There’s some well washed, well worn. Some people have made some awful additions to. There’s, at Beck Isle Museum in Pickering there’s one particular quilt which is made in silk. It’s beautiful quilting, its circles appliquéd on it in golds and browns, it’s a really beautiful quilt and then in one corner someone has tried, I’m not sure if they started to repair it, but they’ve replaced it with 1970s psychedelic fabric and they’re bri-nylon and polyesters and such a shame. It’s just awful, the silk had shattered but better the shattered silk than bri-nylon [DB mm] in these weird psychedelic fabrics. You open it up and you think what a fabulous quilt, then this corner appears [laughs] with this awful fabric in. Such a shame. But the person who did it must have thought they were doing a wonderful job at the time, bringing it up to date, I don’t know [both laugh]. But it’s a shame but there are some beautiful, beautiful quilts. A lot of really good stuff out there. DB: So are you moving more in the direction of, you say you’re in the British Quilt Study Group? 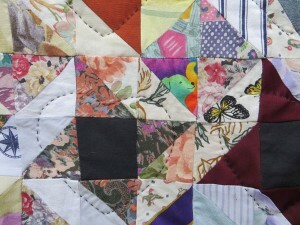 So are you moving more in the direction of looking at older quilts? DB: So that’s a fairly new direction for you to go in. JC: Yeah. We all change don’t we? JC: I still, as I say I like every aspect of it. It’s kept me sane and keeps me happy. DB: Well Janet, thank you so much. It’s been fascinating and I think you’ll find some of your beautiful quilts are passed on and passed on and passed on and become [JC I don’t think so] little treasures of the future [JC laughs]. DB: Thank you Janet, thank you very much indeed.